Soufriere, Saint Lucia, June 23, 2014…It is time for one of nature’s most spectacular performances, Coral Spawning. And it happens right off the beaches of Anse Chastanet, Saint Lucia. Each August, the resort’s scuba diving team accurately predicts the night spawning and prepares to take divers to observe the remarkable phenomenon. This year the event is August 16-18. What is coral spawning? Each year, coral release millions of packets of egg and sperm cells that appear underwater as massive pink and white clouds. They slowly drift to the surface where fertilization occurs. The next day the sea will be partially covered by pink slicks of coral larvae which represents the next generation of one of the ocean’s most vital organisms. Within a few weeks the larvae will settle on the bottom and begin the process of reef building. Of course, this reproductive process takes on added significance at this time as the world’s coral reefs are being decimated by the effects of global warming and other environmental factors. While much of the coral spawning process remains a mystery to science, it is known that somehow each species of coral on a reef synchronizes the timing of its spawning, which takes place only once each year. The key controlling factors seem to be the water temperature, the lunar cycle, length of daylight hours and the tides. The development of the eggs and sperms are triggered by rising water temperatures during the summer leading to the spawning in late summer or early fall. The ideal time for the release of the reproductive cells seems to be a week or so after a full moon when tides and currents are diminishing which provides more hospitable conditions for the fertilization process. The process begins an hour or two after sunset providing the cover of darkness as well. This mass spawning process increases the chances of survival for the larvae as most will be eaten by fish and other sea organisms; but the huge numbers overwhelm the predators insuring that many will live to propagate the species. As always, Scuba St. Lucia is offering special night dives during the predicted period to allow guests to witness this magnificent spectacle. Diving is done on the Anse Chastanet reef, which is located just off the resort’s beach. Snorkelers can also participate as well as the resort now also offers guided night snorkeling adventures. Scuba St. Lucia also has available underwater cameras to capture the beauty and awe of this special event. ANSE CHASTANET resort is known for its great romantic setting and spectacular scenery paired with great service in a tranquil 600 acre setting. There are two beaches bordering on St Lucia’s best coral reefs which offer some of the best swimming and snorkeling on the island. Their professional scuba center, also the island’s best, has programs for beginners and certified divers. Resort facilities include 2 restaurants and bars and full service spa, Kai Belté, offering Yoga classes overlooking the sea and a wide variety of unique treatments that can be foundhttp://www.ansechastanet.com/spa/spa_treatments.html . Adventure seekers quickly find the resort’s unusual 12 miles of hiking and biking trails on the adjacent plantation Anse Mamin. Anse Chastanet offers a myriad of things to do or not to do…perfect for all young lovers. The resort diving operation, SCUBA ST.LUCIA, caters to beginners and experienced divers alike. Beach, boat, wall and wreck diving are all offered. 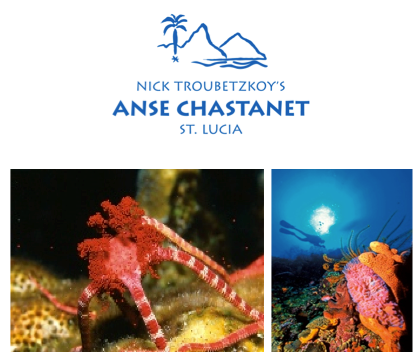 The night dives right on the ANSE CHASTANET reef are a highlight for any diver, particularly during coral spawning!! !